Kaitlin began research with the Brown University BrainGate team in the fall of 2016. She is interested in the neural correlates of movement and is investigating neural dynamics of various brain regions to improve communication and mobility for people with paralysis. 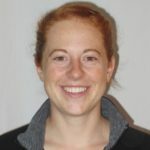 Before starting at Brown, Kaitlin earned a BS in Biology from SUNY Geneseo and an MSc in Clinical Neuroscience from University College London. Her master’s work, in Dr. John Duncan’s laboratory, assessed inter-hemispheric asymmetry of various white matter tracts in epilepsy patients using tractography.